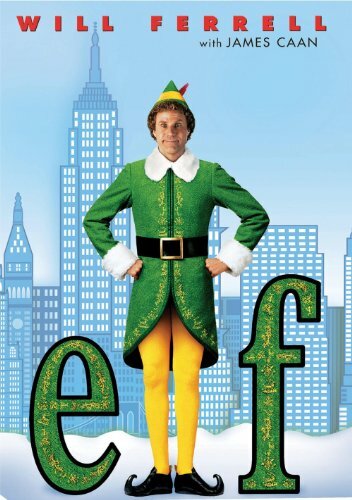 Will Ferrell’s Elf is an unorthodox specimen among movies in that its middle third is the most remarkable. Most movies start competently, slow down in the middle, and finish with a gripping bang. This pattern dates back all the way to Star Wars, which opens upon an exhilarating chase through space, plummets with the introduction of its whiny protagonist Luke Skywalker, then soars again at the end in a heroic rebel mission to destroy the Death Star of the evil Empire. In contrast, the middle scenes of Elf are hilarious while its first and last 15 minutes are some of the worst ever filmed and a sad picture of how low our society has fallen. Will Ferrell stars as Buddy, who is “actually a human, but was raised by elves” after he stowed away to the North Pole in Santa Clause’s bag as a baby. Though Buddy fails to match the efficiency of his fellow slaves (he can only build 85 etch-a-sketches daily, 900 short of his quota), he shares their unwavering sense of altruism and the so-called Christmas Spirit, based on 3 principles: 1. Treat every day like it’s Christmas, 2. Everybody can get on the nice list, and 3. Singing for all to hear is the best way to spread holiday cheer… none of which have anything to do with CHRISTmas, but anyway… Buddy’s elf father feels it’s time for him to enter the human world where he belongs, and so he sends our hero off to New York City to find his biological father, who incidentally is an evil corporate businessman with a position high on Santa’s naughty list, a man charged with murdering his employees’ wives, using foreign banks, sending his workers on luxury cruises overseas, and cheating on his taxes for a decade. At this point, Elf transforms from an insufferable kiddie flick into an uproarious fish-out-of-water story with Will Ferrell’s typical, sophomoric spin (potty jokes and gross slapstick abound). Buddy quickly shows himself to be as unsuited for the big-city lifestyle as George of the jungle. One of his funnier mishaps involves his first meeting with a mall Santa, an encounter that starts with giddy, childlike joy then deteriorates into anger and shock at the deceit propagated by this shameless impostor, who “sits on a throne of lies”. Buddy translates his loathing into action by swiping the man’s beard and provoking a vicious chase around the store that culminates in several Lego skyscrapers being smashed to shards. Elf’s humor mostly sticks to this formula of slapstick and oddball comedy, and the movie mimics Napoleon Dynamite in that its plot consists of many random episodes only loosely sewn together by a broader story arc. The movie excels when it doesn’t try to tell an emotionally satisfying story and focuses merely on crafting silly scenarios around its premise. Here are some of Elf’s better lines. Elf falls apart when it starts to preach the true meaning of Christmas, as perceived by the spiritually dead filmmakers. The last 15 minutes of the movie are basically a song of worship to a false idol who represents a kind of deity not only to children but also to mind-numb adults. Spoilers henceforth: right before the climax, Buddy voluntarily leaves his home after ruining his father’s business conference. Wandering New York City, he happens to witness Santa crash-landing in Central Park; being a loyal elf, Buddy immediately dashes to the scene. Santa explains that that his sleigh fell after the machine’s Clausometer went dead. Santa’s nightly flight depends on belief in his existence, and by the looks of things New York City has a severe lack of belief, which seems like bull as the place is run by Michael Bloomberg, who gladly poisons his brain with all kinds of fairy tales. To save the day, Buddy, his girlfriend, and his younger brother have to “convert” enough doubters to Claustiantiy by singing the mother of all Satanic gospel songs, Santa Claus is Comin’ to Town. Santa’s sleigh gradually gains altitude as more and more people join the chorus, finally leaping into the sky when Buddy’s cynical, grumpy dad casts off his chains of denial and “believes”. And so everybody is united in one cultish mob through the positive forces of collective idolatry and fuzzy feelings of Christmas Spirit. To say that Elf’s ode to Santa Claus is harmless drivel is an understatement: the movie’s final 15 minutes are a heinous love song to secularism and group-think, the 2 forces that most threaten America at large and the meaning of Christmas on a smaller scale. It. Repels. Me. In summary, Elf is a great movie when it asks to laugh at its main character, not with him. The middle of the film concentrates solely on comedic effect and for that reason it succeeds, but the rest of it is an abysmal combination of every measure to devalue Christmas from every insipid TV holiday special. Grade rating: B+ for the middle. As for the rest, to quote my favorite radio movie guys, Avoid It Like The Plague. When my friends suggested that we socialize at a birthday party by playing a single-player computer game called Slender, I was a little skeptical. Video games usually are not the best medium for instigating communion and fellowship, unless they’re competitive multiplayer games with motion-tracking rockets, plasma rifles, magnums, and needlers. I soon learned that Slender is an exception to this rule. While the independently developed horror title is a rather awful game to play alone, it stands beside Apples to Apples as one of the loudest, wildest, and most chaotic party games of all time. I’ll let you decide whether that’s a good thing or not; I stand resolute in my hatred of Apples. Slender is like Minecraft in that it’s a 1st-person indie game with few controls, bad graphics, and a regrettably limited storyline. The former, unlike the latter, sells itself as a “survival horror” game and is the first of its genre that I have experienced, unless you count Halo: Combat Evolved (which threw countless parasitical zombies at me in the final half, most of which were more annoying than terrifying), Halo 3 (which had occasionally dark atmosphere and elements of horror, but also lost its effect by the final act), or Metroid Fusion (a GBA game starring Samus Aran that’s surprisingly intense and creepy). Slender opens in a misty, seemingly uninhabited forest with few landmarks, winding roads, and a lot of crickets. You as the player control some stranger out for a walk (my friends insist you’re a little girl, but you wouldn’t know that unless you checked Wikipedia or something, because the game makes no attempt to identify your character) who is armed only with a dim flashlight to illuminate the haunted woods around you. Unfortunately, this is not the flashlight of Alan Wake and is incapable of inflicting damage to your foes. The goal of Slender is to collect 8 mysterious pages scattered around the forest at various landmarks, including oil tanks, rock formations, abandoned trucks, and the infamous bathrooms. These pieces of paper contain ominous warnings and sketches that are meant to shed light on the game’s antagonist, the slender man, a disturbing figure that pursues the player more and more ardently as the page tally increases. The slender man, who resembles a gaunt, ghostly white, tuxedoed man with ridiculously long arms and no facial features, attacks in an unconventional manner, for he seeks to destroy not your body but your mind. The very act of staring at the slender man makes the player’s character insane and causes the screen to get staticy. Prolonged visual contact with the slender man will end the game in a noisy and obnoxious sequence in which the creature gets you and you meet an ambiguous demise. If you somehow manage to beat the game by collecting all 8 pages, the slender man terminates your character anyway, as Caesar Flickerman and the people behind How It Should Have Ended explain. The best thing to be said about Slender is that it’s free, albeit with the potential cost of a virus depending on where you download it. The worst is that it’s a horror game which isn’t scary and relies on a gimmick in order to frighten the player. Unless you play Slender in a dark room and mute all surrounding noises, the game fails to deliver any substantial jumps, which are all it offers even in the dark. Slender is more startling than it is terrifying due to its lack of story and character development. Because the game makes no attempt to personify the slender man, he is no more than a video game obstacle, like the ghosts of Pacman or the koopa troopas of Super Mario Bros. Nor is he a scary obstacle, because his relationship to the player is unrevealed; nobody can tell you what the slender man does to your character, though numerous theories likely circulate the web. The challenge of surviving is also nonexistent, for if you define survival as the absence of the death, Slender makes it impossible to not survive, as your character can never die. I will say out of fairness that Slender is a very tense game that will cause many people to literally leap out of their seats, which is why it’s more enjoyable experienced with associates. As I said earlier, the game utilizes several gimmicks to make the player jump, first of which is the foreboding heartbeat sound effect that kicks in after you find the first paper. Slender is marked more by suspense than by action; for great periods of time you will trudge through the forest aimlessly, often running in circles, all the while having to endure the sound of your thumping heart. The player grows so accustomed to the sheer monotony of this noise and the emptiness of the woods that he gets a serious jolt whenever either is broken by the appearance of the slender man. Even more surprising than the sight of the slender man is the huge blast of sound he makes whenever he “teleports” to the player’s location (in reality, he never moves in the player’s vision, which further highlights the low production value of the game). Nothing is more effective at disrupting Slender’s uneventful gameplay than the trumpet of the creature’s approach. On top of its simplistic but unnerving sound design, the game also inspires a deep hatred of turning corners, especially in the claustrophobic corridors of the crapper. Navigating the bathroom is in many ways the defining feature of the game, because the player knows before entering every intersection that the monster could be right around the bend; once one penetrates it, the building’s tight enclosure becomes painfully obvious. Unfortunately, these elements are overshadowed by huge flaws, most notably the game’s pacing. I’ve played Slender twice with a group of 10-some friends, and although we all (OK, mostly the girls) laughed and screamed together for about 45 minutes, I got so bored of wandering the forest and finding nothing that when the slender man finally did show himself, I purposefully ran into him rather than fleeing. Slender distinguishes itself more by slow and monotonous gameplay than by true horror, which is why I rushed to end the round. A good video game, like any book or movie, should be mentally stimulating, well-written, and entertaining in its own right. While the reactions of various people to Slender are mildly interesting, the game itself is downright dull and unremarkable and fails to meet the basic requirements for a horror game. For those who wish to play a truly scary game, I recommend buying Alan Wake, Metroid Fusion, any of the old Infocom text adventures (particularly the Zork trilogy and The Lurking Horror), or either of the Portal games, which are characterized not only by humor but also by dark atmosphere, suspense, and an overwhelming sense of isolation. Although none of them are free, they offer far more fear than does Slender. Mark Steyn, the Joseph Addison of his day, has written extensively about racial code words, but no one has broached the topic of debate elitist code words. Here are some of the many terms and phrases debaters subtly employ to make themselves sound more knowledgable/hip. This is not a complete list; suggestions are welcome and may be added. Brink – an extra subpoint for those unsatisfied with the complexity of 4-point disadvantages. Calculus – synonymous with “comparison” or “weighing”. Debaters who stink at math love this one, because they can warp to an alternate universe in which they're modern-day Euclids. Cross-apply – synonymous with “again”. An excellent non-response to damning arguments that sounds responsive but most often isn’t. Dehumanization – synonymous with "bullying". Whenever the affirmative team kills some people or takes away their benefits, the negative speaker will assert that they dehumanize the victims of their plan. Double-bind – synonymous with "It's a trap!" Either their bomb works and kills off hundreds of people or it fails and they kill us. These arguments often fall under the "false dichotomy" fallacy. Fill-in-the-blank-spec – synonymous with “insolvent”. Flinging this text speak around will confound parent judges, but pick up college alums, who like to think they’re smarter for knowing what a “spec” is. Framework – roughly stands for “this is the only argument that matters”. Perm – Slang for permutation. Synonymous with "not mutually exclusive". More text speak that will win college judges over and alienate those judges who don’t belong to a counter-plan club. Press – synonymous with “argument” or “contention”. As applied to stock issues, especially topicality. Roadmap – synonymous with “outline” or “direction”. Debaters often give one, but rarely adhere to it. Shell – again, synonymous with “outline” or “strategy”, I think. It has no strict definition that I’ve yet heard explained, but it sounds cool, so people drop it in random places. Turn – synonymous with "The opposite is true." Actually one of the better arguments one can make in team policy, hence the disposition of so many debaters to misuse it blatantly.